Music plays a vital role in the success of film and television productions. 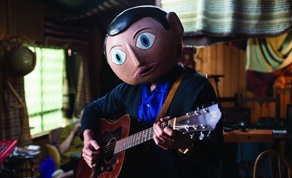 In any given scene, the right music can maximise the tension, fear, anxiety or conversely the joy, excitement or otherwise of the drama unfolding. On the other hand, the wrong music can impose and grate on the viewers senses – distracting from an otherwise compelling performance. Getting the music right of course doesn't just impact on the production and how it is perceived by the audience; a successful score and track placement can garner extra publicity and attention for the production, particularly when it spawns a hit record and the resulting sales of the soundtrack add a significant additional income stream and a myriad of marketing opportunities. Planning the use of music in a production is vital if the optimal result is to be achieved. The earlier a producer knows which music will work and the budget available to obtain it, the more likely it is that the rights will be successfully obtained in good time. Before embarking on an explanation as to how to go about clearing the use of music in a production, it is important to explore which rights must be cleared for various uses and the varying sources for these clearances. This can cause confusion amongst those beginning to grapple with the rights issues. It seems easier to fathom for instance that a set of rights exist in a film script and another set of rights in a film (a performance and recording of the film script) than it is with a piece of written music and the actual performance and recording of it. With music it may help to visualise a piece of sheet music (the composition comprising the musical notes and lyrics) acquiring one set of rights and the subsequent performance and recording of that music acquiring a separate sets of rights. 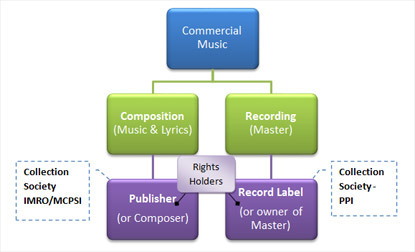 A composer will usually assign some of his rights to a collection society (IMRO/MCPSI in Ireland*) and very often the remaining rights will be signed to a publisher. IMRO/MCPSI in turn grant blanket licences to broadcasters and production companies for certain limited uses of music. For instance, if an episode of Fair City has a hit song playing in the background in a scene set in the local pub, this will likely be covered by the blanket licence as an incidental use. If however the song was to feature more prominently in the production then the producer or music supervisor may need to approach the composer/ publisher for a specific licence to use the song in the desired manner. Producers should determine whether they are covered by their commissioning broadcasters licence or if they should obtain an Independent Production Company Blanket Licence (IPC) by speaking to MCPSI early in the production process. If it's a one-off production or requires unusual clearances an individual synchronisation licence tailored to the specific use may be more appropriate. PPI*** provide blanket licences for use of recorded music to broadcasters but not to production companies. A production that has been commissioned by an Irish broadcaster may have some clearances covered by a blanket licence. It is advisable for the producer to communicate with PPI regarding this. If the use falls outside of the blanket licence the individual record label or owner of the master may need to grant a specific licence. Where a blanket licence does not cover the use of music there are three options for producers which we will discuss in greater detail below. After concluding a composer agreement, the film/TV producer will also want to own the recording of the commissioned music and to that end will usually arrange and pay for the recording in order to own the masters. It is important at this point to conclude agreements with the studio, record producer, recording artists and performers to ensure all rights to the finished product are now secured. Where a film/TV producer wishes to experiment with music already composed and recorded, he can approach companies that hold what is commonly termed 'library music'. These companies provide a one-stop shop offering music that is already cleared for use. There are no lengthy searches for the rights owners or protracted negotiations with record labels and producers. Library music companies hold databases of clearly defined music genres suitable for every imaginable situation. Usually this music is unknown and has been specially composed and recorded for the library company. This is generally the most economical route for those on a tight budget. MCPSI have access to a vast database of library music companies. Those wishing to use the service are provided with a rate card providing details of the charges involved. All that is required to avail of this service is registration via the MCPSI website and shortly afterwards a vast array of music choices are available to the user. The rate card stipulates the price for various types of uses and provides an accurate means of costing the use of music. Finally, if a producer wishes to obtain rights to use commercially available music he/she will need to approach both the record label to clear the use of the master recording and the publisher (or composer) to clear the use of the composition. So what happens when a producer just does not have time to track down rights owners and negotiate with them? Licensing companies have emerged to provide such a service. Many of the larger companies have already obtained clearances from a host of record labels and publishers and can often contact the parties relatively quickly to negotiate the terms and final fee. MCPSI also offer this clearance service and are a first port of call for many producers in Ireland. It is highly recommended to approach MCPSI or licensing companies as early in the production as possible, they can explore the requirements and are ready to act when it emerges that something very particular is desired. It cannot be stressed enough however that commercially released music can take a considerable amount of time to clear. If this is what is required for the production – act early! 5. 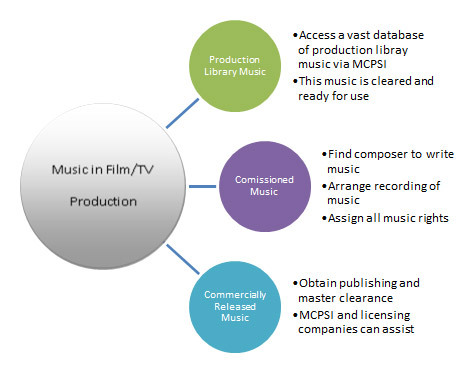 List commercial music desired for production and approach MCPSI or licensing companies to clear rights. Whatever a producer decides regarding the source of music, and it may often be a mixture of all three discussed above, it is essential the producer is aware of the rights needed and the rights actually obtained in order to maximise the post production potential. A good lawyer will ensure that the broadest set of rights are acquired on the most favourable terms – ensuring the opportunities for cross-platform promotions are not hampered in any way. The result can be a resounding success for everyone involved. * IMRO –Irish Music Rights Organisation. MCPSI – Mechanical Copyright Protection Society of Ireland. ** The U.S. Constitution requires the initial owner of a copyright in a work be the author. Usually, the author is the person that actually creates the work, however when a work is created by an employee as part of his or her employment (or where the creator is specially commissioned) the work is usually deemed a work for hire. The author of the work for hire is not the actual creator but is the person or company who hired the creator.